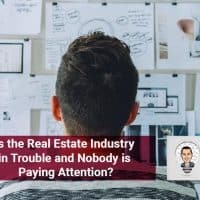 You are here: Home / Podcast Episodes / Is the Real Estate Industry in Trouble and Nobody is Paying Attention? Is the real estate industry in trouble and nobody is listening? During this episode we share examples of how the industry has changed. And we answer that question. Realtors are educators, not salesmen. This changing shift has made real estate an information exchange. Agents should embrace this change and ramp up their customer service. We will share how to stay in the game and why this isn’t so bad. People have access to the same information realtors do. It’s no longer our biggest advantage. How the internet has completely changed EVERYTHING. The role websites like Zillow and Trulia have in this shift. Why people just want the information now. How agents can improve their customer service. Why this change is a good thing for the industry. If you want to read the blog post that started this conversation it will be in the resources below.